If you are struggling as much as I am for choosing only one dish, then you have to love tapas culture! Barcelona Wine Bar is an award-winning Spanish tapas restaurant, serving small, creative and elegant dishes with fresh ingredients and bold flavors. There are two locations in DC but my favorite one is on 14th Street. Alex Ureña, the executive chef of the restaurant, brings his vast knowledge of the Spanish and Basque cuisines and creates a more interactive dining experience. Their kitchen is open until late, so if you’re craving a midnight snack or looking for a late dinner, Barcelona is the right place to go. Reservations are highly recommended unless you are more of a last minute person, then you may as well enjoy sitting at the bar area. Since the first time I visited this place, it immediately caught my attention. It’s amazing how fast you can escape from the crowded and loud 14th Street to this welcoming atmosphere. From the moment you enter the restaurant you are taken into a rustic yet elegant place. 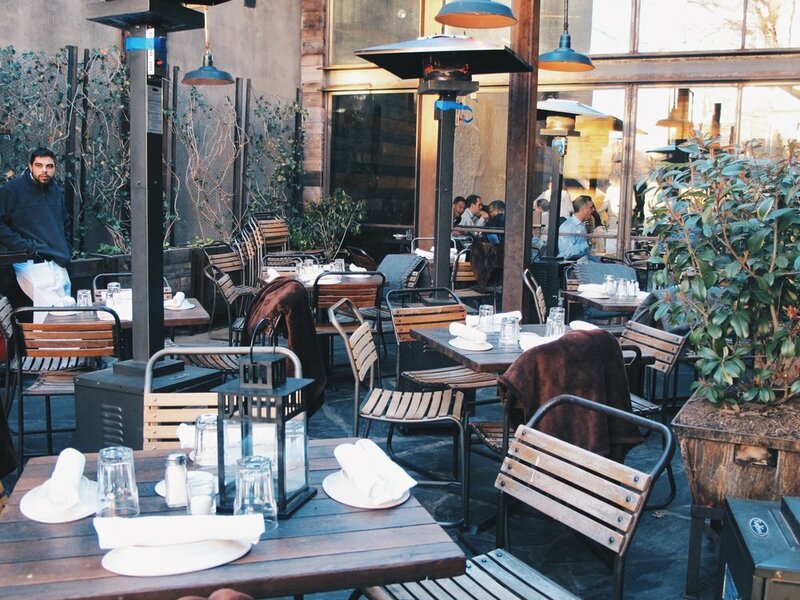 You also have the option to sit at the courtyard, which operates all year round due to the heat lamps, fleece blankets and the outdoor fireplace which adds onto the cozy atmosphere. As you can tell by the name, Barcelona has a strong focus on wine with over 40 varieties of wine by the glass. Thus, you may want to start with a glass of wine and some cheese complemented by their fresh, crusty baguette. There is a large cheese section but I would suggest the Ibores with some jam on the side. Don’t worry if you look at the menu and cannot figure out what it says. The staff is extremely friendly and they are more than happy to talk you through the menu. One thing that I really love about this restaurant is the variety of dishes they have for every type of eater. For the vegetarians, I would suggest the Broccolini, cooked with garlic and chili flakes and the Potato Tortilla. For the meat lovers, I would definitely recommend the Hanger Steak served with a mouthwatering truffle vinaigrette. You can never go wrong with the Patatas Bravas, a classic Spanish dish that tastes delicious. Another top choice is the Gambas al Ajillo (garlic shrimp), but trust me, no matter what you order you won’t be disappointed.